We are always committed to producing the most suitable products for our customers. stand holds your watch sturdy with elegance, durability and fashion. protecting cases. The max suitable case thickness is 10mm. Just need to fasten 2 springs of the back of of the iPhone stand, so convenient for you. 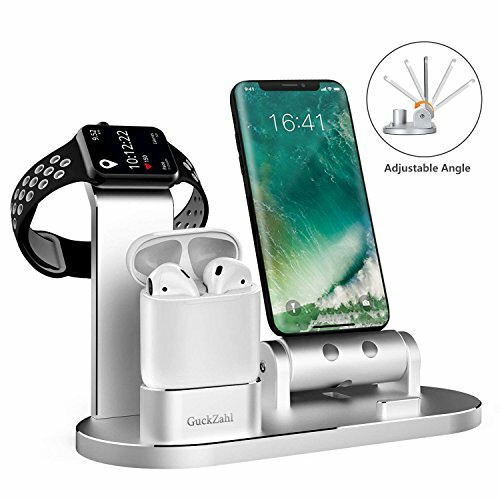 【4 in 1 APPLE WATCH STAND】Original designed by GuckZahl, serves as an iPhone holder, an apple watch dock, and an AirPods stand; Adjustable angle of iPhone stand. Vertical iPhone charging station meets your viewing angle for facetime. Steadily holds your Apple Watch, 45 degree angel supports nightstand mode; Specially designed as an Airpods accessories, avoids your Airpods missing; quickly charges with the gift cable. Apple Watch magnetic charging cable is NOT INCLUDED. 【A NICE DECORATION WITH GOOD ORGANIZATION】It is convenient to charge your Apple watch series 3, series 2, iPhone, and AirPods at the same time in one place with this apple dock- sturdy, neatly, and orginazed; The aluminum apple watch charging stand looks good and elegant, perfectly decorates your nightstand, bedroom, hall, and whole home. 【SOLID BODY AND NICE FINISH】 Constructed of premium aluminum alloy with refined polishing, the iPhone watch stand perfectly finished for a solid build, highlights edge and smooth surface. The non-slip pad on the bottom of iWatch charging stand enhances the stability of the whole unit. The anti-scratch rubber and the TPU back on iPhone watch dock protect your Apple Watch and iPhone from scratching. 【CONVENIENT AND EASY】A finger comfortable metal nut is designed to make iPhone charging stand works just fine with or without a case, which means you do not have to take the case off when charging your iPhone. The exquisite protrusion in front of the iPhone mount acts as a stand for watching movies or other entertainments. Big convenience for your life. 【COMPATIBILITY】This apple watch charger dock is universal for Apple Watch Series 3/ 2/ 1/ Nike+ / Sport / Edition (both for 38mm and 42mm); Apple Airpods, iPhone 8/ 8 Plus, iPhone X, iPhone7 / 7 Plus, iPhone 6 / 6s Plus, iPhone SE/ 5s/ 5c, iPad Air, iPad Mini ect. Please feel free to contact us for any question, our professional customer service team is standing by. If you have any questions about this product by GuckZahl, contact us by completing and submitting the form below. If you are looking for a specif part number, please include it with your message.